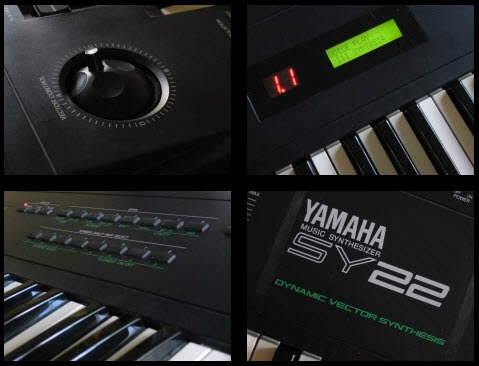 Yamaha SY22 Dynamic Vector Synthesizer – BALL of fun! I found a neat little gem of a synth today called the Yamaha SY22 Dynamic Vector Synthesizer. What caught my eye was the track ball style controller in the upper left hand corner of the synth. I also noticed the “vector synthesizer” label written on it and started to wonder what that was all about. I plugged it in and gave it a test run. I was really impressed with the sound and the ball controller. Very cool so I picked it up along with a Rom sound card Proteus Impressions (Sound Source Unlimited, Inc.) all for $50 bucks. The ball controller is basically split into 4 separate sections A,B,C, and D. When you move it up and down you can move between the A and B voices. Moving from left to right you get the D and C voices. The two main settings are level and detune. You can really get some terrific “motion” effects plus it’s really cool to easily fade between the four voices. It’s very unique to me and loads of fun. Using the detune you can get a chorus effect really well along with the built in reverbs, delay, and other effects. Another thing I found to be very interesting with the SY22 is the panning effect. With the ball you can move the voices around giving you an easy way to pan the sounds around you head. It’s hard to explain but I noticed that when testing the synth the voices were like floating all around. It’s simply panning the voice right and left but on other synths you have to physically program that in whereas with the SY22 it’s easier to move things around. Furthermore, you can record the ball controller motions for your patches. This is really cool and similar to the Roland JP-8000 which also allows you to record motion data. This really allows you to create some really dynamic and motion oriented soundscapes. Pads are awesome with SY22 and like all Yamahas with FM you can get some really gritty bass and synth sounds. Note that the SY22 is a low frequency synth so you get that DX7-ish gritty sound which I really like. Some people say the SY22 is a bit noisy but mine is super quiet. Any noise I do get it fits the patch well and actually am thankful for it. The LCD is bright which is great and it’s very durable but light weight. It has 61 keys and you might say it’s quite portable. There is a Card Slot in the back and it takes the Yamaha MCD64 Ram cards. I actually recently bought a Sweet 16 Card that has 16 MCD64 cards all in one. That will be great for the SY22. The Sweet 16 Card allows me to store sounds for my V50, SY77, and SY22 all on one card. ( I just choose one of the 16 cards inside to save voices to ). With regards to editing again some people say it’s tedious and difficult. Frankly I come from the Yamaha DX7 era so it’s definitely easier than that beast, so to me the SY22 is easier. It’s easy to hook up an editor via MIDI and tweak anything you like. Sure it’s harder than today’s synths, but manageable. I really like the Yamaha SY22. It’s the unique vector control and recording that really makes this useful to me. You can definitely get some great sounds out of the SY22 and for live performance it’s pretty fun too working that ball controller. Once you get organized on how you want to set it up with your sounds it’s really cool. It takes layering your sounds to a whole new level. Here is a pretty good demo found on Youtube of the Yamaha SY22 in action. I find in today’s pop music the use of Diatonic Tenths is increasing. What are Diatonic Tenths? Check out the video below and a good bass player who knows his theory will tell you all about them. As a guitar player myself originally, I learned about Diatonic Tenths in college. Little did I know that in today’s pop music you’d be hearing it all over the radio. Listen carefully to what this gentleman is saying about Diatonic Tenths in the video and think about how you could apply this to synth pop and dance music today. You can create some really cool melodies and bass lines with the use of Diatonic Tenths. Sometimes you’ll find the secrets of music today are not really secrets. Rather they are just ideas crafted from little known ( or sometimes well known ) concepts in musical theory. It’s also important to reach out to other instruments like the bass and guitar and see how you can apply approaches to those instruments to your synth and keyboard playing. When you find yourself running out of ideas or inspiration, dive into some musical theory and try something new. I was delighted yesterday to find and pick up a used Roland Fantom X7 at a local second-hand music shop here in Nagano-city, Japan. It was in mint condition with case and the Jon Lord’s Rock Organ SRX-97 board inside. It also had max memory and the audio track expansion kit included. Inside my Roland Fantom XR I have the SRX-12 EPs expansion board which I took out and put inside the Fantom X7. The setup is really nice and I’m quite excited to have it for composing songs, patterns, and backtracks. Having already a Roland Fantom Xa and XR, I am quite familiar with the X series and it’s been my favorite of the Roland workstations for some time. I’m not going to compare the Roland Fantom X7 with other Korg or Yamaha workstations because I firmly believe that they are all different and best suited for those who like that particular style. Although I’m also a big fan of the Yamaha Motif series, In Japan I’ve had more access to playing Fantom X series keyboards. How everything is displayed on the Roland Fantom X7 is very intuitive for me and I especially like how the audio tracks and sequencer work. Plus the multi-sampling capabilities are excellent. The Fantom X7 has 76 keys and for me the action is very good. 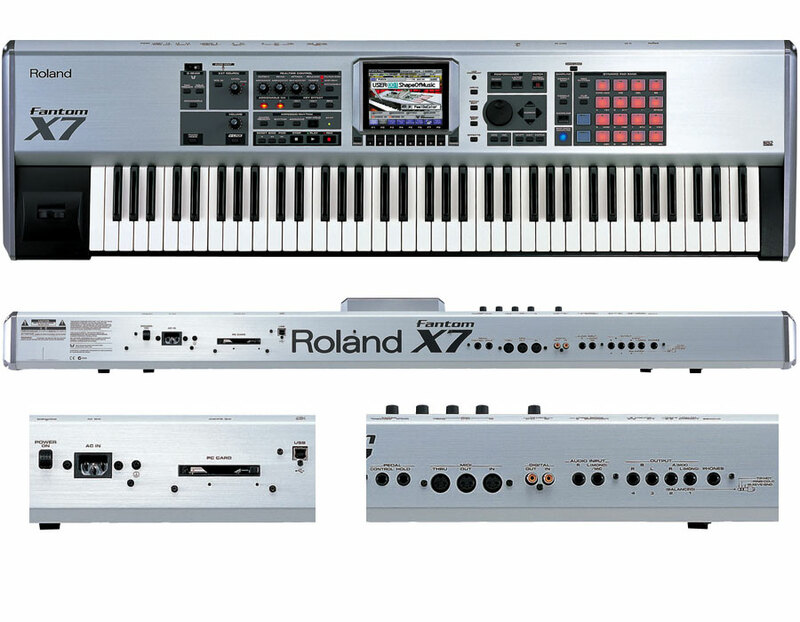 I should also add that finding a Roland Fantom X7 is not easy and they are quite popular here. With regards to sound, I think the Roland Fantom X7 is pretty good and I particularly like the SRX-12 EP expansion board for Rhodes sounds. I must say that to my ears, the SRX-12 sounds much better in the Fantom X7 then in my Xa or Xr rack. It’s likely because you can easily tweak the parameters of the SRX-12 board using the X7 Piano Mode section. The Xa and Xr do not have this. Immediately when I started playing the various rhodes sounds with the Fantom X7, I noticed a pretty big difference. In fact, I think the SRX-12 board sounds noticeably better than my Yamaha ES Rack that I’ve been using for practice. I don’t know why, but getting a good EP or Rhodes sound on the Roland Fantom X7 is pretty easy. It’s a nice surprise. I’ve heard the Fantom G is also pretty good, but I honestly have never played one although I have heard them. For me, I just simply like the layout, sound, and functionality of the Roland Fantom X7 Workstation series. Not to mention the reasonable cost of the X series today. It suits me well and it just plain works well for my musical interests. 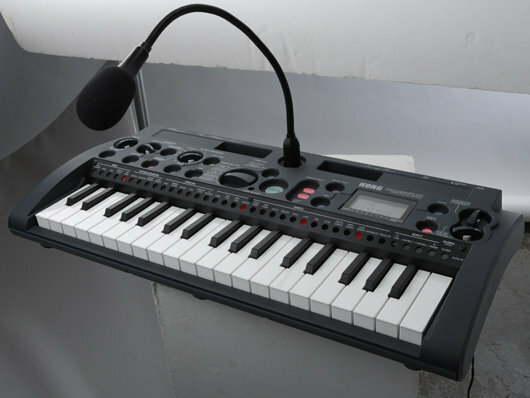 Like the Roland XP-80, some people say the Roland Fantom X7 is likely to become a classic. We’ll see about that. Like many have said already, the Roland Fantom X7 is simply a great all in one workstation that will do just about anything you need. It’s a classic in my book already. Here is the Roland Fantom X7 in action.